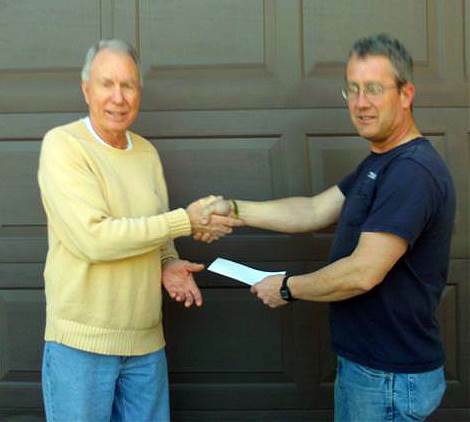 Retired USPS employee Marty Schill with Wayne Tuttle. Investing for the future is a solid component of a comprehensive retirement plan. Former USPS employee Marty Schill saw the wisdom of preparing for a post-working life, and routinely invested his money in avenues that provided future growth opportunity. One long forgotten element of that strategy recently came to light when he received an unexpected call from Wayne Tuttle. Tuttle is a custodian at the Sherwood Station in Topeka, KS. He was in the process of removing lockers recently when he encountered a piece of paper on the top shelf of one of the removed lockers. The item was a U.S. Savings Bond issued in 1983 with Schill’s name on it. Tuttle found Schill’s contact information and called him to let him know he had found something he’d be interested in. Schill was grateful for the discovery and return of the bond. Originally purchased for $50, Schill took the bond to the bank and discovered that it had increased in value from the $100 face amount to $280. “I thanked Wayne for being diligent in checking my locker and for bringing such a surprise to my house,” said Schill. Redig, SD, Postmaster Edgar Kumley and Dakotas District Manager Darrell Stoke. Since his hospital records were lost in a fire years ago, Edgar Kumley can’t tell people his exact age. But in postal years, he’s 67, and counting. 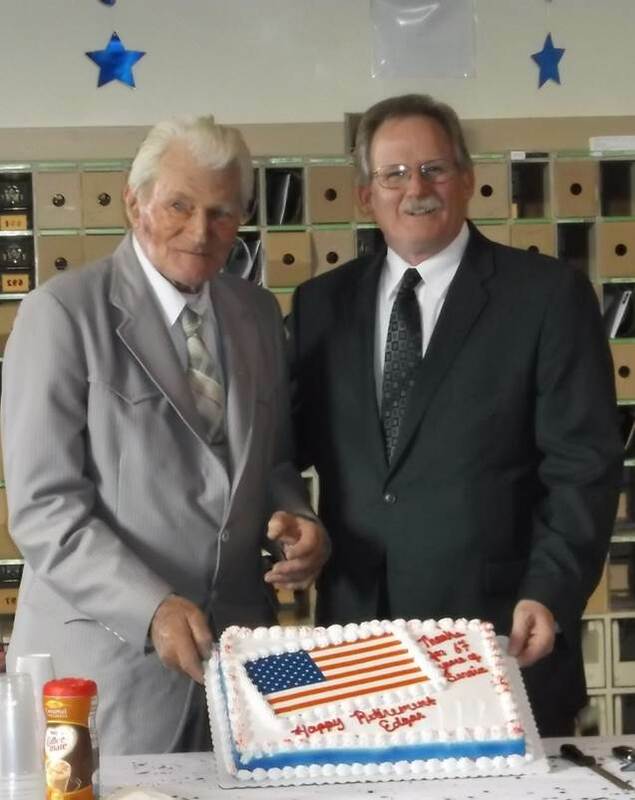 That’s 67 years of service as Postmaster at Redig, SD. Appointed acting Postmaster in 1948 by President Harry Truman, Kumley had the interim tag removed from his name a year later. And he’s been providing service to this unincorporated community in far northwestern South Dakota (considered too small to track by the Census Bureau) ever since. “I’ve never met a problem I couldn’t solve,” Kumley told the Rapid City Journal at a gathering that celebrated his official retirement in January. 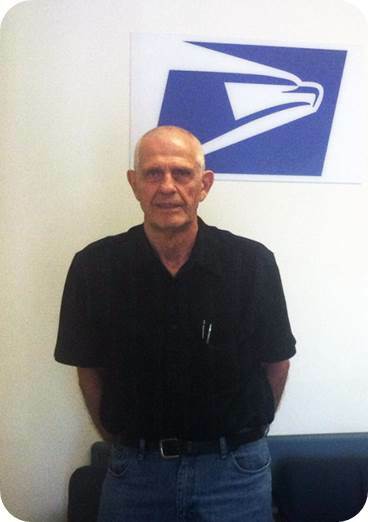 He leaves as the third-longest serving Postmaster at the same office in USPS history. While Kumley is officially retired, his legacy of service will continue. 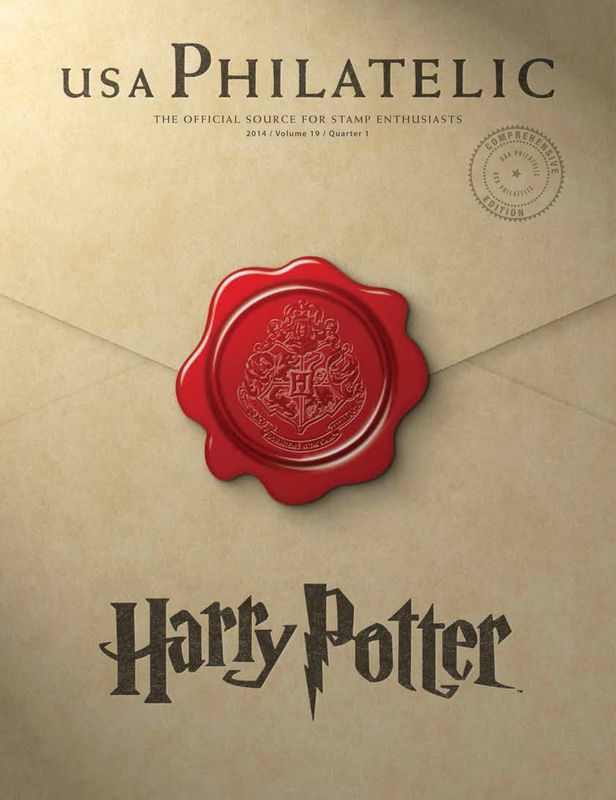 He’s signed on, as an annuitant, to continue as Postmaster Relief at the Redig office. On September 17, Mid-America District Area Maintenance Technician Ken Blankenship, domiciled at Springfield, MO, received the prestigious National Safety Council’s Award for 1 Million Miles or 30 Years of driving without a preventable accident. The award was presented by Field Maintenance Manager Michael Fisher while Field Maintenance Supervisor Joe Murphy looked on. 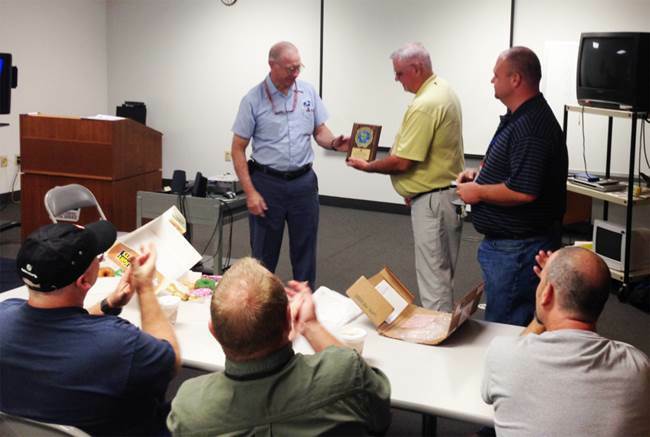 On September 26, Ken retired with 35 plus years of government service. 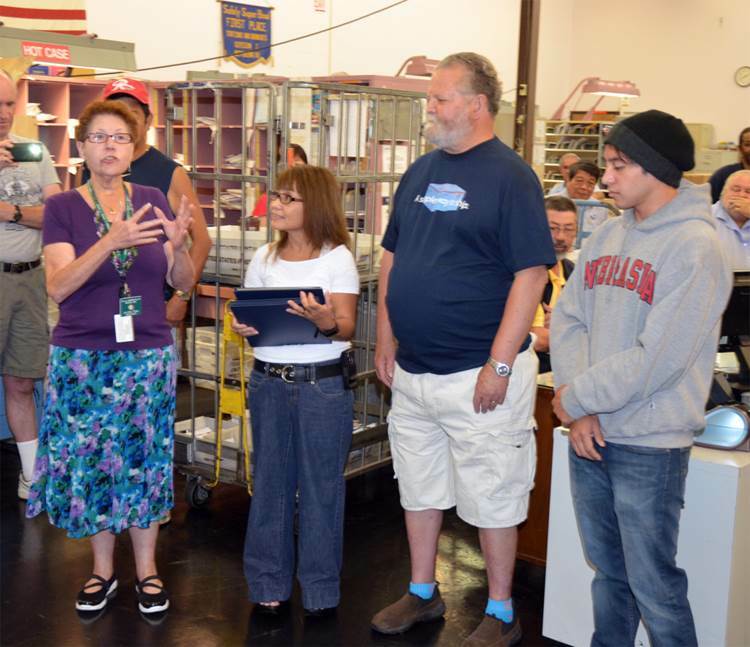 NALC Branch 79 President JoAnn Pyle congratulates Jerry Jonason, second from the right, on his retirement after 57 years as a Letter Carrier in Seattle. To his right is his wife and to his left is their son. Fifty-seven years ago, Jerry Jonason walked into a Seattle post office to begin a new job as a letter carrier with no thought in his mind about how long he might remain. Jonason was saluted by his fellow employees at Seattle’s Bitterlake Station, where he finished his career, and many people who retired ahead of him. “I will miss these people as well as many of the customers on my route that I’ve gotten to know over the years,” he said. Jonason said he has no special plans for retirement other than to visit the Philippines where he owns a house. The opportunity to enjoy a long retirement after a distinguished career is a goal to which many aspire. For one retiree, however, unforeseen circumstances transformed retirement plans into the birth of a new career. James Hansen worked for various businesses throughout his youth until he found a permanent home at a long-haul trucking company. After spending 21 years at the firm, he retired at the age of 64 to enjoy his golden years. Three years after his retirement, however, his former employer filed bankruptcy and ceased operation. Initially, Hansen’s retirement wasn’t effected by the unexpected development. Six years after the company dissolved, however, he became concerned that his retirement could be reduced. To avoid losing needed income, Hansen made the decision to return to the workforce. He tried his hand at working for a hair salon company for six months and then spent another six at a major retailer until he finally obtained employment at a company he truly desired. When he received the news that he had been selected to become a casual mail handler at the Postal Service in 2008, his hope to become a USPS employee was fulfilled. In addition to working as a mail handler, Hansen also worked as a clerk and a custodian. In early August of this year, he received some welcome news. “I had been with USPS for slightly more than six years when I was made a career employee just 18 days before my 79th birthday,” said Hansen. Though his retirement income from the trucking company was never reduced, Hansen enjoys working as a career custodian for the Postal Service in Salt Lake City and has no plans on retiring again anytime soon. Would Two Years Be Enough to Retire Early? Early out incentives are common for businesses looking to reduce expenses without resorting to layoffs. For some businesses, those particular incentives can be more generous than others. Coming this spring, FedEx will be offering some of its employees up to two years of pay as an early out incentive. It’s an organizational effort to reduce costs by up to $1.7 billion within the next two years. Employees who volunteer to leave FedEx by May 31 will receive four weeks of pay for every year of service. That incentive maxes out at two years of total pay. What do you think of the early out incentive? In the past, it’s been all or nothing. You can either retire completely from your full-time job or not at all. The only middle ground compromise would have been to retire and find a job working part-time somewhere else. With a recent transportation bill signed into law by President Obama on Friday, July 6, 2012, however, federal employees might have the opportunity to mix the two options. Situated deep within this 593 page Conference Report (legislation negotiated between the House and Senate), Section 100121 on phased retirement was added, changing the landscape of options for potential retirees. Instead of an all or nothing proposal, retirement could consist of a sort of working retirement. An individual who would like to spend more time enjoying life beyond working years, but still spend time with co-workers in a job they enjoy, might have the opportunity to do both. The bill was proposed as a way to prevent the knowledge and skills of older workers from abruptly leaving the workforce and moving into retirement. Skilled individuals will now have the opportunity to mentor the younger generation of workers and prepare them for the road ahead while also enjoying their partial retirement. Partial retirement can consist of working one to four days during the workweek. The retirement pension received during phased retirement will be based on a pro-rated amount of the eligible annuity. An individual, for example, working 40 percent of the time would receive 60 percent of their retirement benefits. 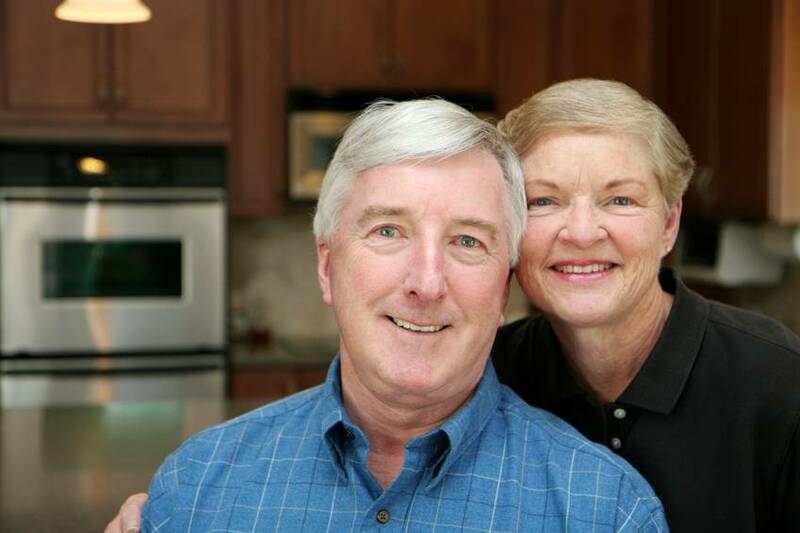 The phased retirement option can only be selected once in an employee’s lifetime, though it is possible that a partially retired individual could return to working full-time. Once full retirement is chosen, the additional benefits accrued for the percentage of time worked during phased retirement will be recalculated and the individual will receive a composite annuity. For individuals vacillating between retiring and continuing to work, this might be an option that could make the retirement itch easier to scratch. Is a phased retirement something you’d likely consider in the future if it becomes available?